With its 26 degrees of freeedom, the hand is the most versatile instrument on the human body. So why not give it the recognition it deserves, and make it the subject of your next computer masterpiece! However, if you are not an expert animator and do not have on hand (pun!) a boned ‘hand’ model together with a simple animation tool, then you come a bit unstuck. This is where "The Handy Gesture Maker’ comes to your rescue. 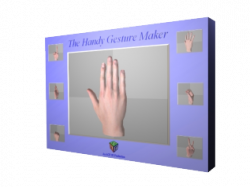 Using this tool, you can quickly and easily configure any number of different hand gestures, save each one as a simple text file which can then be loaded into your "3D RAD" application. maybe a great new computer game with "Handy Andy" as the main character !